A crop is at its highest quality at the time of harvest and must be properly handled to minimize loss of quality. 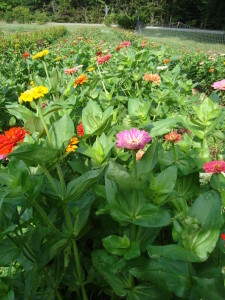 To maintain quality during marketing and in the final consumers’ location, cut flowers must be handled and stored at the correct temperature (as cold as possible), have a high carbohydrate level (use floral preservatives), and be free of water stress, ethylene, and microbial contamination. In-house postharvest testing is valuable in identifying problems that occur within an operation, handling customer complaints, and providing customers with current postharvest information. A postharvest testing system does not need to be elaborate and should take only a few minutes to set up and monitor each day. In fact, the simpler the system, the more consistent and useful the results are likely to be. A postharvest test facility for cut flowers can be in the lunch room or a countertop in the office. In setting up a testing system for cut flowers or foliage, obtain clean bottles or vases. Use the same preservatives and water as normally used in the operation. 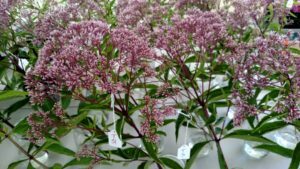 For a new species, the easiest test is to place half of the flowers in water as a control treatment and the other half in water plus preservative. For current crops, compare a few untreated flowers to a few flowers after treatment, which will allow you to determine if your handling procedures are effective. Place the flowers in an area permanently set aside for the postharvest tests. Check the flowers each day; note which flowers are no longer acceptable and record the number of days from harvest to the end of vase life. The stems can be individually tagged with the harvest date and treatment by using small stickers or paper tags with string. Hydrators promote water uptake and typically contain chemicals to reduce water pH. Hydrators usually do not include sugar and thus, are not used for holding flowers long term. Some flowers may be damaged by keeping cut stems in hydration solution too long. Commercial hydration solutions are available and the amount of times the stems should be kept in the hydration solution varies from a few seconds to 48 hours. The ‘quick dip’-type solutions primarily reduce the amount of microorganisms on the stems. The long duration solutions are used for holding flowers 8 to 48 hours until final processing or for shipping in water. Processing/holding solutions usually contain sugar, an acidifying agent, and an anti-microbial compound. These solutions are used for the transport and storage of flowers. Products with a greater percentage of sugar are used to open buds and promote flower development. Consumer preservatives/vase solutions are intended for the arrangements and bouquets used by the final consumer. Consumer preservatives usually contain sugar, an acidifying agent, and an anti-microbial compound. The preservatives are available in bulk for retailers to use or in individual packets for the customer to mix into the water when the flowers are brought home. Crop specific preservatives may be used for species that have special requirements. For example, specific preservatives are available for such crops as tulips, lilies, carnations, roses, alstroemeria, gerbera and others. Anti-ethylene agents are used to protect cut flowers from ethylene, an odorless, colorless gas produced naturally by plant materials or by incomplete combustion of heating fuels and engine exhaust. Concentrations as low as 100 parts per billion and exposure times of as little as 2 hours can lead to damage. Numerous symptoms can occur: leaf, flower, and bud abscission; bud abortion; rapid flower senescence; and epinasty (the distinctive curling and drooping of leaves or bracts). especially detrimental during shipping when plant materials are enclosed and air circulation is limited. Silver thiosulfate (STS) and 1-methylcyclopropene (1-MCP) are currently the most commonly used anti-ethylene agents. STS is available as AVB and is mixed with water. Cut stems are placed in the solution for one to several hours. 1-MCP is available as a powder which creates a gas after mixing with water and buffer. 1-MCP leaves no residue and is as effective as STS for some crop species , but not as effective on other species. 1-MCP is marketed under the name EthylBlock® and can be legally used on both cut flowers and potted plants.